A canvas tent provides you with a traditional look and quality living in your backcountry camp. Natural, 100% cotton canvas is very durable…strong enough to last a lifetime. The innovative cabin tent design from Montana Canvas ensures that you will receive the highest standards of construction, materials and comfort. Their tents have passed the test of time, with families handing down their Montana Canvas Wall Tents from one generation to another, along with precious memories. 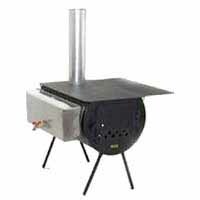 In conjunction with a wall tent stove, such as a Cylinder Stove or Riley Stove, a canvas wall tent can be the most important survival tool backcountry travelers can take with them. If you are wet and cold after a long day of hunting or trail riding, your life may depend on your ability to get warm and dry. A canvas tent retains heat well and is especially good at absorbing some of the interior condensation created by drying clothes or boiling water. 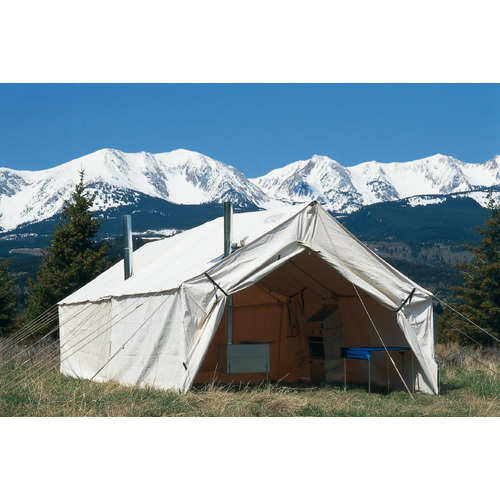 Wall tents made by Montana Canvas are available in all sizes in 10 oz and 12 oz weights (10 oz is the most popular). 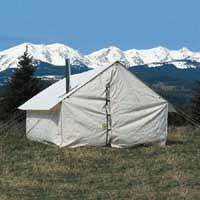 The canvas used in a Montana Canvas wall tent is a true 10 or 12 oz canvas before it is treated. 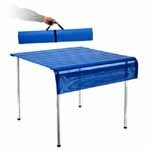 The fabric has been pretreated with flame retardant, water proofing and mildew resistors and meets the California Fire Marshall specifications. The 10 oz canvas tent is the perfect weight for almost every application, while the 12 oz canvas tent provides you with the weight and durability for tents that remain set up for months at a time. Selecting the right sized canvas tent. The size of your canvas wall tent can make all the difference between comfortable and miserable backcountry trips. To determine the ideal size of your canvas wall tent, a good rule of thumb is about 24 square feet for each person and/or furniture such as camp cots, chairs, tables, and extra gear you intend to have in your canvas tent. This formula allows for some “comfort space” or the ability to squeeze an extra person into your canvas wall tent when the need arises. A wall tent provides excellent shelter, but must be cared for properly. Canvas must be completely dry before being rolled up and put away. If your canvas tent is even slightly damp when you store it, it may grow mold and mildew. These can be killed with a very dilute solution of bleach and water, but the stains from the mildew will remain. Scrubbing your canvas wall tent is not recommended as you may remove the fire retardant treatment on your canvas tent fabric which cannot be reapplied aftermarket.